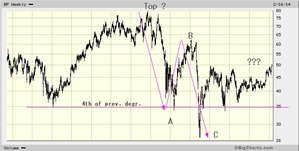 All three yield about 3% and have p/es of about 10x to 13x. 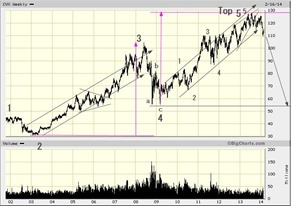 Royal Dutch is the only one to have a perfectly clear B-wave, but then it also consumes an inordinate amount of time (4 years) doing nothing. 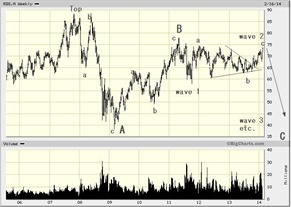 Exxon sports a clear wedge (as the c in the B-wave) which is equally bearish. It also does that Mnt. Everest thing by climbing to just over $100 and falling back from exhaustion. 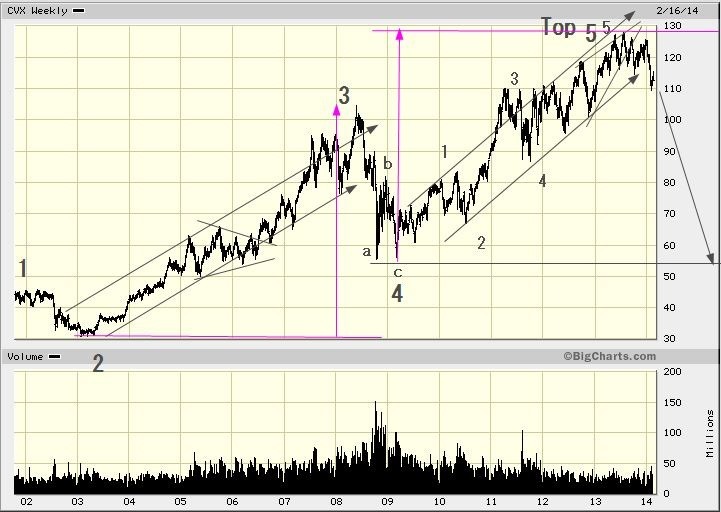 Chevron is the only one of the three that (arguable) has a 5th wave going into the recent top. 5th waves are normally completely retraced (and then some) during the next retracement. What all three have in common, at least using EW rules, is that they are about to lose 1/2 of their value. Royal Dutch (the ADRs) and Chevron are about the same in size at roughly 225 bln. 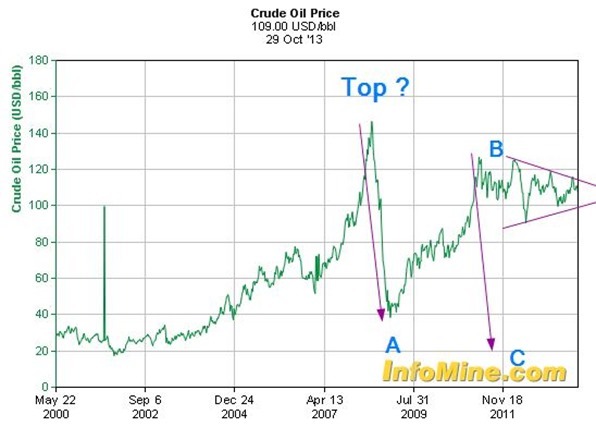 As you can see, we hope, Royal has followed the price of crude oil quite accurately whereas the Chevron guys have chosen to ignore the fundamentals almost entirely. 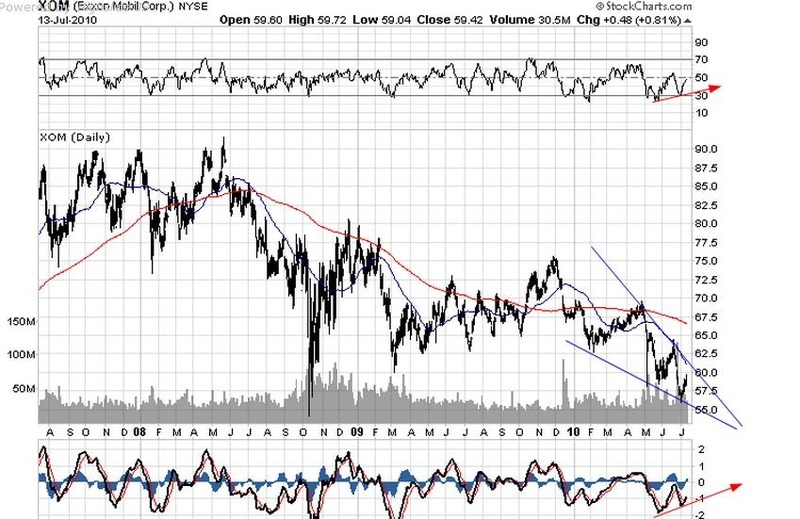 Whether or not the various counts in these charts is correct is not all that important, but we do expect oil to drop back to the $40 level or so sometime in the future. 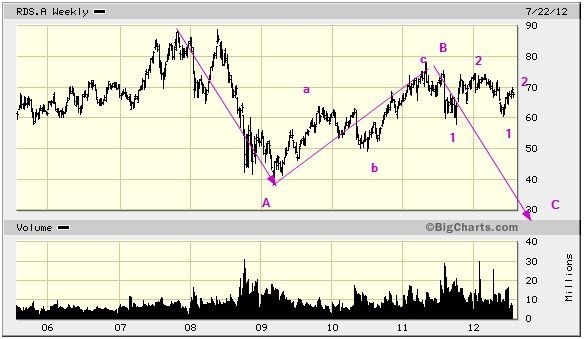 The triangle, if there is one, would suggest that oil might actually go up, but the B-wave looks pretty compelling. 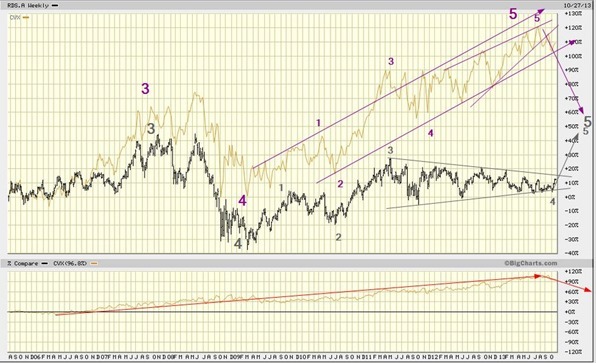 In any event the extraordinary spread between the two integrated companies is, in our opinion, about to collapse. 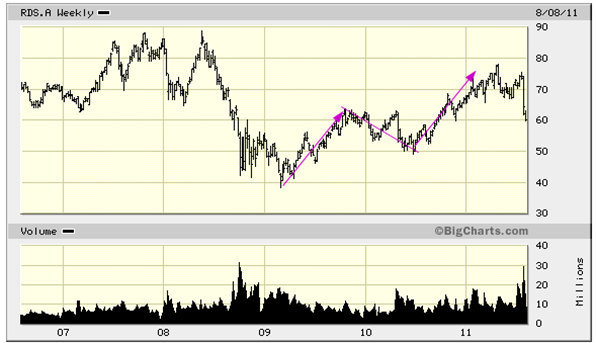 The spread now at about 100% since 2006 is probable as good as it gets. 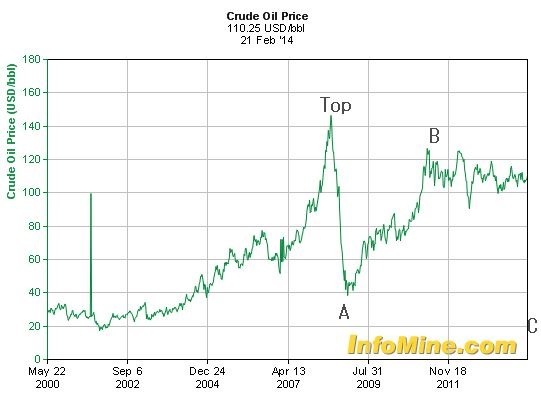 Sell one Chevron against a buy of two shares of Royal. Given the higher dividend on the Royal (by almost 2%) you actually will have a positive carry. XOM and RDS.a the integrated oils, update. 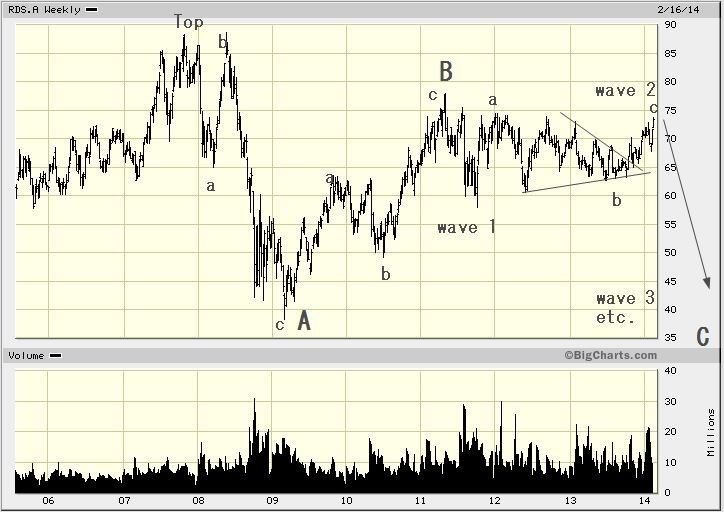 This thing is a wedge, pennant, diagonal whatever. 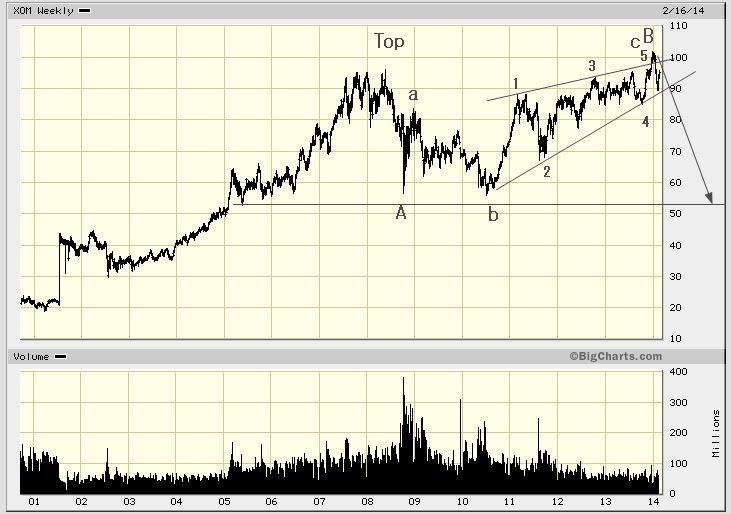 When, not if, it breaks down we will be back at the bottom and then some. 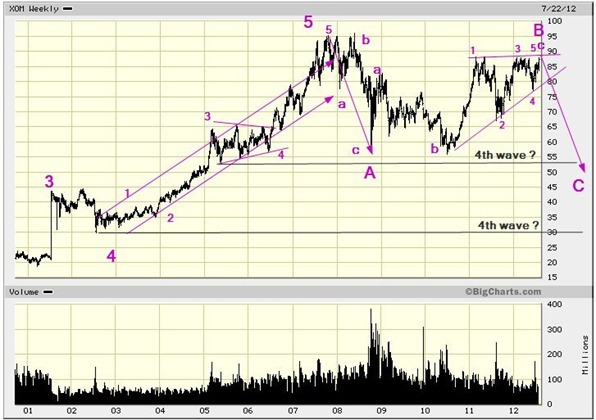 Wave 4 of previous degree is not at $53 but at $30, easily attainable if C becomes 1.62x A. 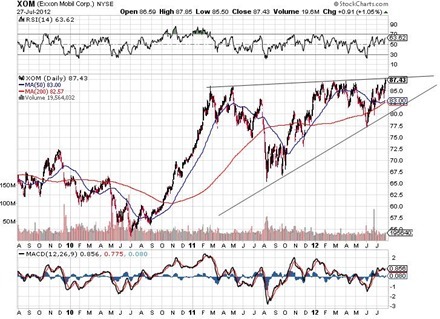 The stock was downgraded yesterday by one of the big European houses (UBS?) but the target was raised to $110, go figure. This time the target was dead on but, so far at least, the anticipated drop has not yet happened, but neither has the opposite. If this is a 1-2, 1-2 situation things could get nasty real fast. The target, as with XOM is also around $30. 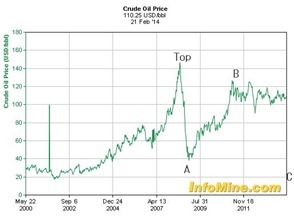 Among the integrated oil companies Royal Dutch has served best in predicting what oil might do. The (very clear B-wave) announced well in advance that oil was not going to $200, at least not for a while. 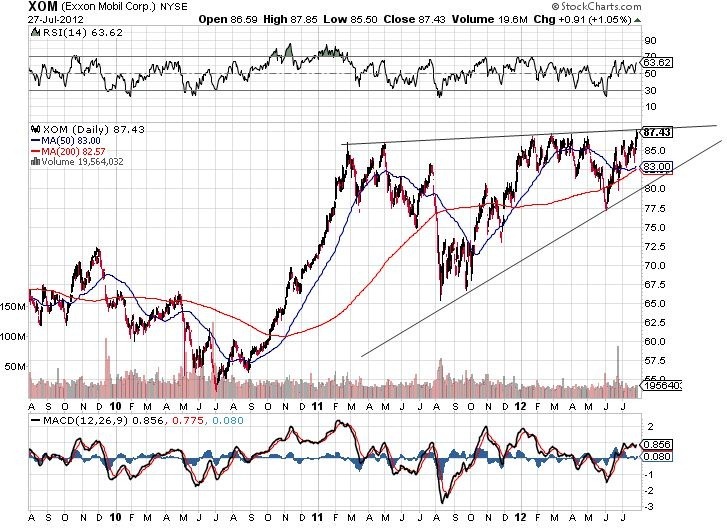 Here we are at about $60 with very clear overlap, virtually making an immediate rise to higher highs virtually impossible. 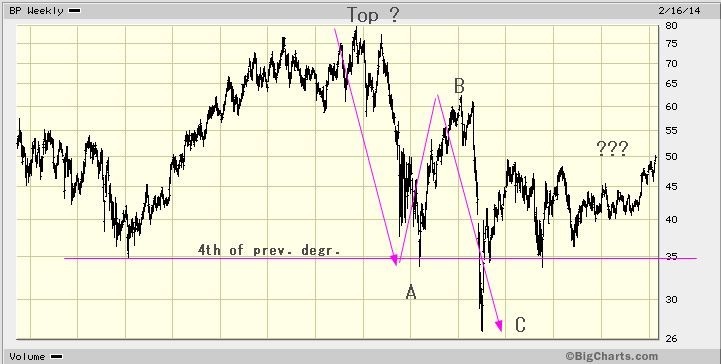 This leaves only a more complex correction which would call for a drop to about $40 anyway, or straight down. 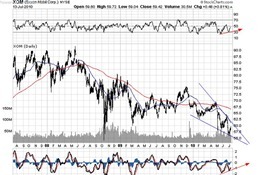 Eitherway it is not likely that oil will hold last nights lows of $79.